I often receive questions about vacuuming rugs from rug owners, asking if they should vacuum rugs, and if so how to do it. First of all, YES – rugs should be vacuumed. If any of you have hard floors in your home, then you know how often you need to sweep and dust because of the constant fine layer of contaminants that settle into your home. This grit settles on rugs also, but because you do not notice it, this can work its way into the base of the fibers of your wool rug and it creates abrasion that can cut those fibers. 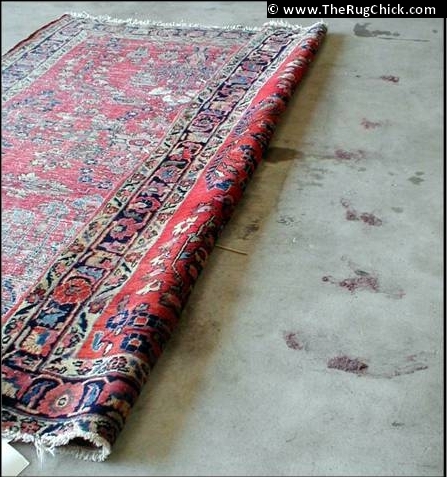 This is why rugs wear down in spots. So it’s important to do a regular “dusting” of your rugs to take off that top layer of settled dust and bigger pieces caught in the fibers from shoes, feet, and paws. Even rugs hanging on the wall will have a layer of dust on them. For weekly vacuuming, you do not need an abrasive beater bar vacuum. A better choice is a canister, or setting the beater bar at a higher level so the bristles are not continually brushing against the fiber. When a rug has not been vacuumed regularly, then the dirt embedded in the base of the rug can be too lodged in to release, so you need a little more help. Back in “the day” these rugs would be hung up and beat with a rug beater to whack the dust out. Running vacuum along the back of a rug can shake out pounds of soil. A wool rug can hold several pounds of dry soil in a square yard before it “looks” dirty. It’s not uncommon for us to pull 5-10 pounds of soil from a large rug just from vacuuming. This is a great attribute of wool, it acts as a fantastic air filter, grabbing soil from the air and hiding it in the small scales of its fibers, and the rug will still look good. The negative of this is that rug owners tend to wait until their rugs look dirty to get them cleaned, and by this time there can be pounds of soil in that rug causing damage to the fibers. Have you ever had a tiny rock in your shoe, and how even when it’s very small it drives you crazy because it hurts? This is what happens with a rug, these tiny little rocks get lodged in the fibers and when you walk on that rug it cuts and scrapes the fibers. 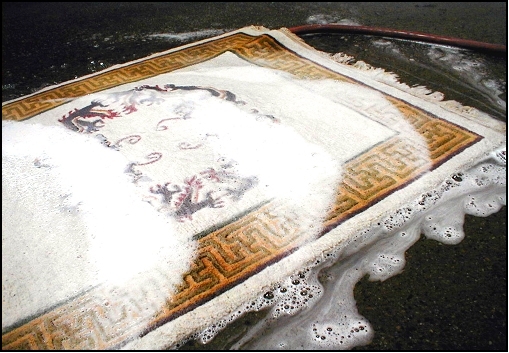 This is why dusting is so important – to help extend the life of your rug. And if you are thorough, you can even extend the length of time needed between professional cleanings. How often should you clean your rugs? That depends. Rugs need a good bath! A rug under regular use should be washed every 18 months. If you have pets or lots of kids, or high traffic on the rug, you want those fibers free of contaminants more often, so annual cleaning would be a smarter choice. Washing the rug removes the contaminants from the entire rug – it’s the most thorough way to clean rugs, as well as the most gentle. Rugs can live for centuries, and can be handed down from generation to generation … especially if you care for them enough to care for them properly.